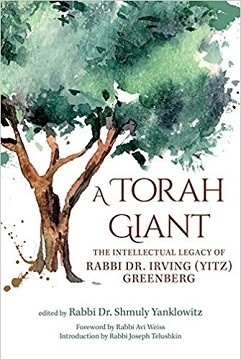 Discover the breadth of wisdom provided by this generation’s giant of Torah: Rabbi Irving “Yitz" Greenberg. Rabbi Yitz is one of the most renowned leaders in contemporary Jewish communal life. His dedication to foster a more interconnected and vibrant Judaism has been felt across the academic and broader world. In this new work, the legacy of Rabbi Yitz is discussed at length by those who have been affected by his inclusive model of contemporary Judaism, approachable erudition, commitment to fostering meaningful interfaith dialogue, and constant striving to make the world a more just place. These intellectual progenies divulge the lasting impact Rabbi Yitz has had on their lives and the lives of people around the globe. Rabbi Dr. Shmuly Yanklowitz is the President & Dean of Valley Beit Midrash, the Founder & President of Uri L’Tzedek, the Founder and CEO of The Shamayim V’Aretz Institute, and the Founder & CEO of YATOM. As a global social justice educator, Rav Shmuly has volunteered, taught, and started missions across five continents. He was named one of "The Most Inspiring Rabbis in America" by The Forward, and as one of the “Top 50 Rabbis in America” by Newsweek. Shmuly, his wife Shoshana, their biological children & foster child live in Scottsdale, Arizona. Rabbi Avi Weiss is founding rabbi of the Hebrew Institute of Riverdale – the Bayit, Bronx, New York, and founder of Yeshivat Chovevei Torah and Yeshivat Maharat. He is also co-founder of the International Rabbinic Fellowship (IRF) and PORAT: People for Orthodox Renaissance And Torah. Joseph Telushkin is a rabbi, scholar, and bestselling author of eighteen books. His book Jewish Literacy is among the best-selling contemporary works on Jewish thought. He lives in New York City.